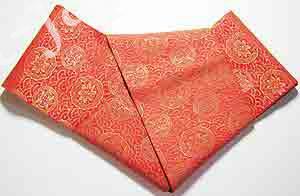 Tyeing an antique hanhaba obi on sarasa komon kimono. “Fukuro” means a bag or a sack. 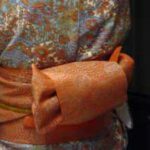 Fukuro-obi is obi which configuration is like a sack as its name shows. 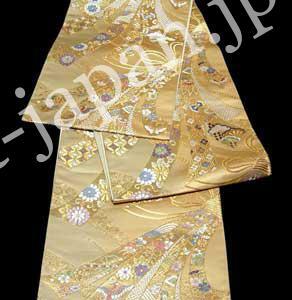 Generally, Fukuro-obi is regarded as prestigious, it is coordinated with formal kimono. 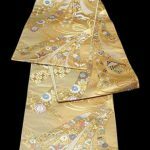 Fukuro-obi is gorgeous and luxury using plenty of golden or silver yarn with delicate embroidery. The design is arranged on one side of the whole body. Fukuro-obi can be said “formal” obi, whereas Nagoya-obi is often casual. 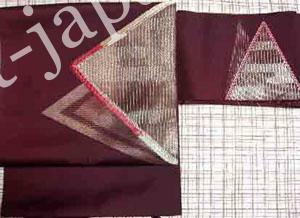 Nagoya-obi is simpler configuration than Fukuro-obi and easy to gird. 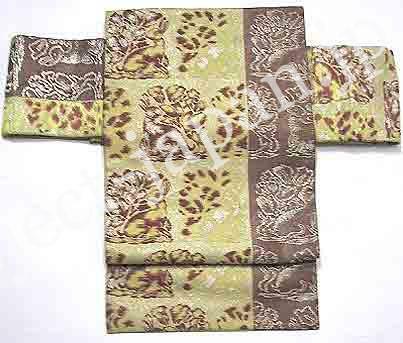 So it is convenient when you want to enjoy kimono casually. 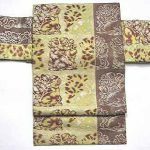 There are both piece-dye type and yarn-dye type. The name is said to be derived from the place-name “Nagoya”, because Nagoya-obi was designed in Nagoya in the last days of Taisho Era (1912-1926). There are many types and applications. “Han” means “half” and “Haba” means “width”. 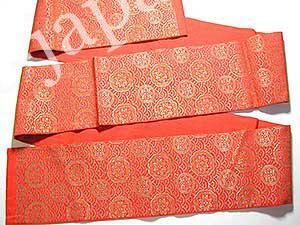 As its name suggests, its width is around 15 cm (5.85″), whereas the width of the standard obi is about 30cm (12″). 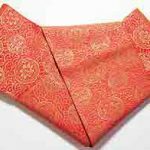 Hanhaba-obi is coodinated with casual kimono such as Komon or yukata. “Zen” means “all”, “tsu” means “through” and “gara” means “design”. Patterns of Zentsu-gara are on the whole body of obi. 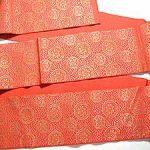 “Rokutsu” means “60% of obi”, and the main designs are arranged on one part which is wrapped around the waist (“Tesaki”) and another part that is tied on the back (“Tare”). 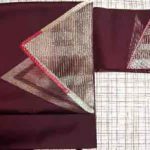 The main designs are arranged on the part that shows up at the front of the body and the part coming out at the back when girded.